As a national brand reaching your customers through a reseller or channel partner network, you know it's critical to coordinate and leverage marketing activities with them. More than ever your marketing budgets are under scrutiny, while at the same time there's growing pressure to achieve sales goals and prove marketing ROI. 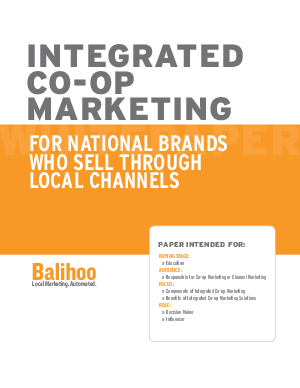 This whitepaper outlines the key components of building an integrated co-op marketing program that achieves your key results and helps your local affiliates be sophisticated marketers.